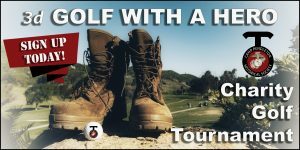 Friday, April 19 is the last day to register and purchase your ticket to play in the CPHS “Golf with a Hero” golf tournament. 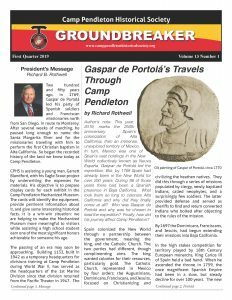 The latest issue of the Camp Pendleton Historical Society (CPHS) Groundbreaker newsletter is out! Members who do not have an email address on file with our Membership Director (cphsmembership@gmail.com) should receive their printed copy by Saturday, March 23. 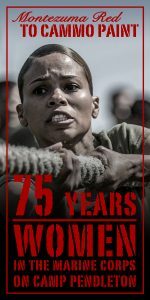 An exhibit, “75 Years – Women in the Marine Corps on Camp Pendleton”, is currently on display at the Marine Corps Mechanized Museum (2612 Vandegrift Blvd, Camp Pendleton). The exhibit includes artifacts and memorabilia showing the history of Camp Pendleton women Marines. From those early women who performed drill marches in high heels to the recent development of an integrated School of Infantry, the exhibit relates stories of these determined Marines. The exhibit is open Monday through Thursday from 8 a.m. until 4 p.m. and on Friday from 8 a.m. until 1 p.m.
To arrange a tour of the exhibit, please contact the museum at (760) 725-5758 or via email mcbcampen_history@usmc.mil. The Camp Pendleton Historical Society (CPHS) is dedicated to preserving and promoting the rich and colorful history of the land that is now Camp Pendleton. Our interests span the entire history of the region, to include prehistoric times, native American culture, the Spanish mission era, the rancho story, and finally, the United States Marine Corps ownership since 1942.